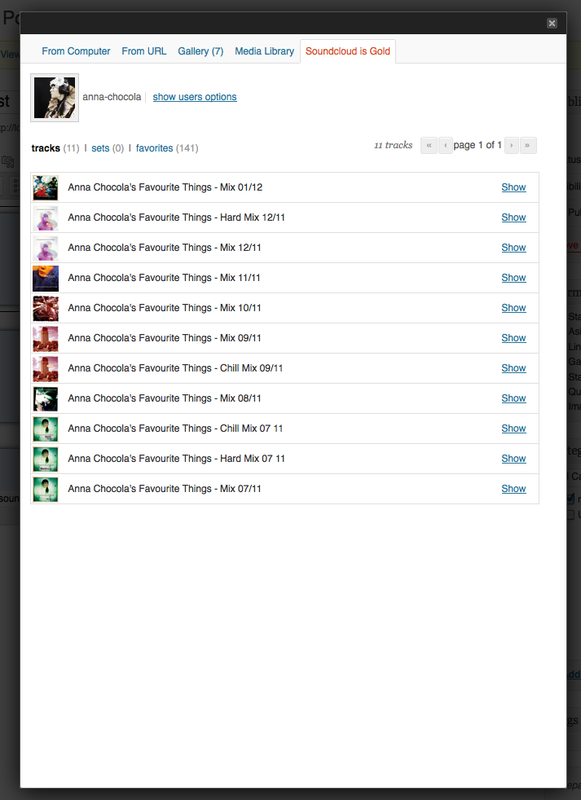 Wordpress plugin to easily add tracks, sets, favorites to your website. Live preview. 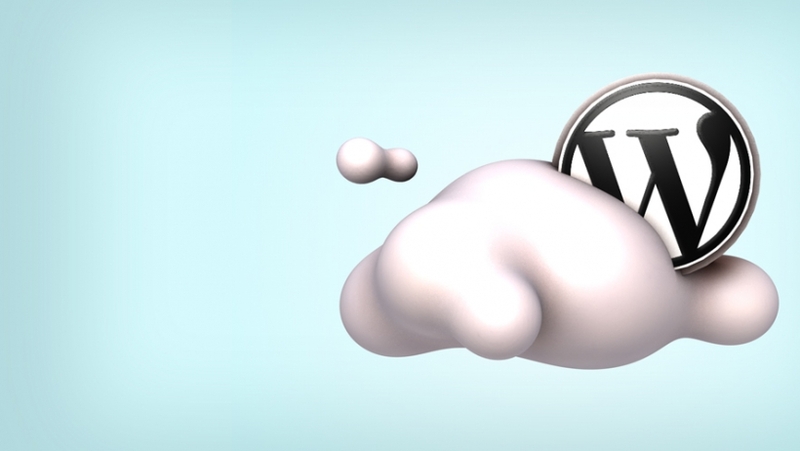 Soundcloud is Gold integrates perfectly into wordpress. Browse through your soundcloud tracks, sets and favorites from the ‘Soundcloud is gold’ tab in the post’s ‘upload media’ popup window. 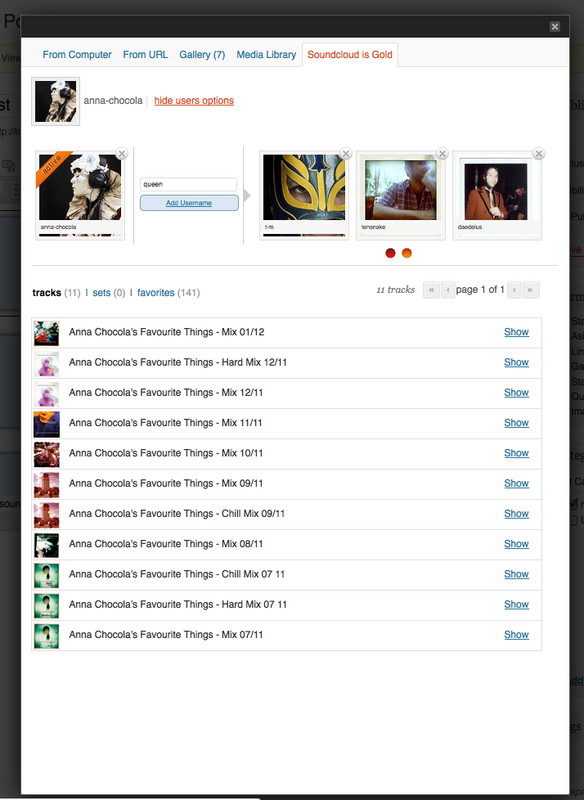 Select, set and add track, sets and favorites to your post using the soundcloud player. Live Preview, easy, smart and straightforward. 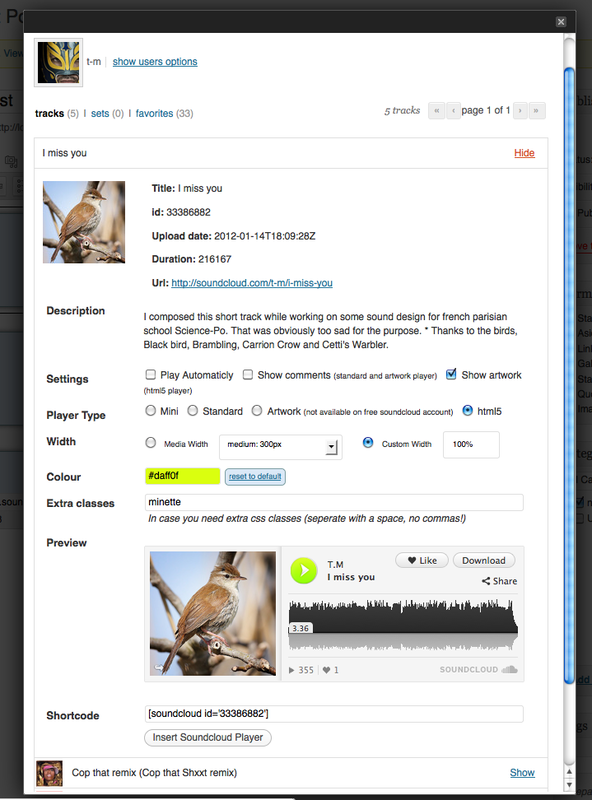 Now with soundcloud’s official html5 player and Widget to display latest track in your sidebar! 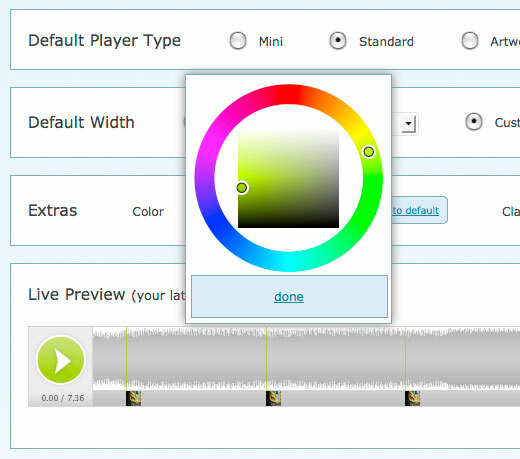 You can set default settings in the option page, choose your defaut soundcloud player (Mini, Standard, Artwork, Html5), it’s width, add extra classes for you CSS lovers, show comments, autoplay and your favorite color. You’ll also be able to set players to different settings before adding to your post if you fancy a one off change. If you love it say it by liking this page, tweeting about it or by leaving a comment and if you use it donations are always welcomed. 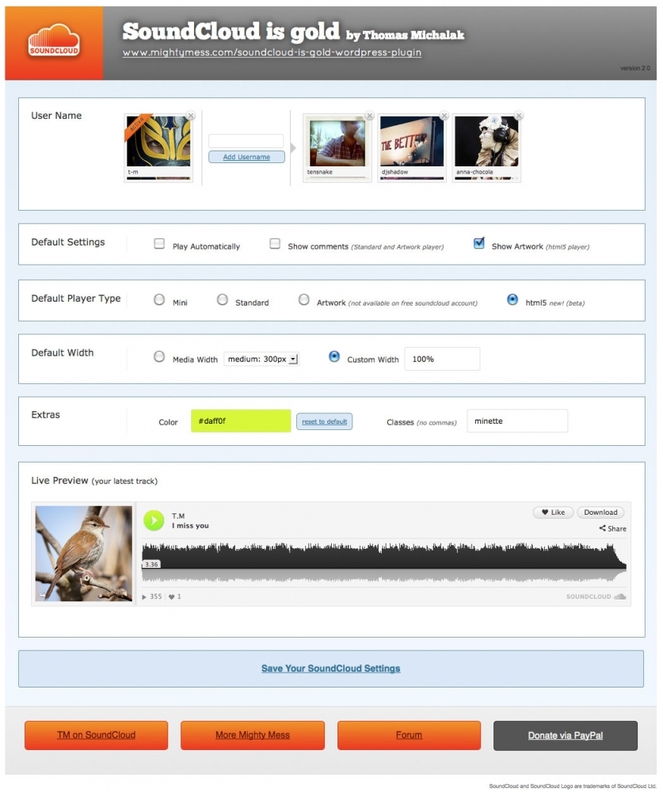 Browse through your soundcloud tracks, sets and favorites from a tab in the media upload window (see screenshot), no need to go back and forth between soundcloud and your website. 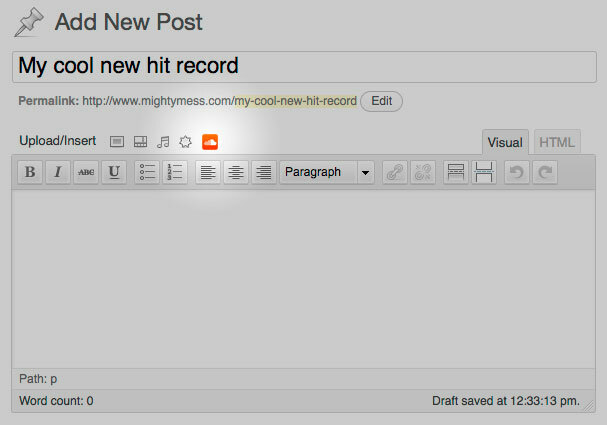 Live Preview in the Tab, see what does what instantly (see screenshot). Integrates perfectly with wordpress media upload by using the same listing style that you get with the images (see screenshot). 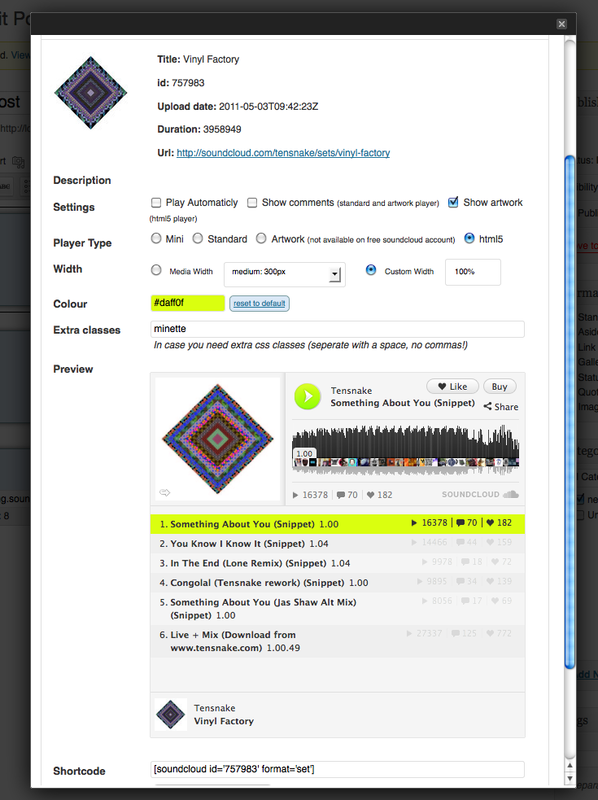 See track’s info directly in the tab (description, url, cover, etc…). Plugin construct shortode for you, no need to remember any syntax. Styled shortcode for a neat view in the text editor.